Personally, I think it’s important for consumers to realize the potential dangers with supplements. The dietary supplement industry is not regulated by the FDA. As one can imagine companies like USP Labs can get away with a lot. There are a few, however, that are morally responsible in creating their products. Companies like NOW and Source Naturals that make reliable supplements. You won’t find any artificial additives or unnecessary fillers in their products. Another safe supplement that I like is The Ultimate Meal. In closing, if for one reason or another whole food isn’t doing it for you and you are determined to include supplements in your diet, I suggest treating your supplement intake the same as your whole food intake. In other words, look at the ingredients for potentially harmful ingredients like DMAA or even artificial dyes and additives for tastes. If a supplement resembles nuclear waste it shouldn’t be in your body. Also, pay attention to how you feel after taking a supplement. 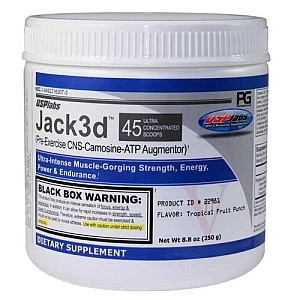 I’ve talked to countless people after taking “Jack3d” who told me their face itched, or their heart started racing. As someone who has taken many different supplements it is scary to think about the ramifications related to obvious supplementation. When it comes to supplementation, be smart, use your head and don’t underestimate the potency of these unregulated substances.